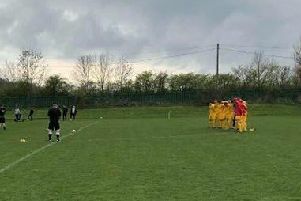 Alnwick Town left North Tyneside empty handed, and in Ross Moore’s case with a sore head, after a 3-2 defeat at Whitley Bay A in the Northern Alliance Premier Division on Saturday. This was a game Alnwick were literally chasing from the start, after conceding a goal inside the first minute, without even touching the ball. Paul Dunn was the man who gave the Hillheads side the perfect start, and it got worse when Mackenzie Sharpe added a second after thre Alnwick fullback was beaten out wide and the ball whipped into nthe box. Phil Airey had a shot wide for Alnwick and they finally managed to get themselves back in the game when Airey tapped in a Midgley cross . They then went agonisingly close to an equaliser before half-time when Henderson rattled the crossbar and at half-time it remained 2-1. Alnwick looked more like themselves in the second half and they finally drew level after an hour when Midgley flicked in from a corner. Moore then sustained a head injury, which required hospital treatment, and he was replaced by Colley. Moore was bandaged up and later allowed to return home. But on 84 minutes Whitley Bay struck a killer blow when James Lee netted a third for the home side to take all three points.